The decision to move a loved one to an assisted living community is never easy, especially when he or she suffers from memory loss. For loved ones with Alzheimer’s and other types of cognitive impairments, care and comfort must go hand in hand with stimulation and safety. That is why the Rose Lane Neighborhood offers specialized programming and care options designed specifically for people with Alzheimer’s and other forms of cognitive impairment. Our staff has the training and support derived from our long experience and deep expertise in caring for residents with memory loss. Life at Rose Lane, residents, and their families find a supportive, home-like atmosphere where physical and emotional needs are recognized and met. We have worked intensely to create a structured environment with enhanced safety for residents in Rose Lane. From accommodating dietary requirements to creating specialized programming, to monitoring medications and helping with personal hygiene, care is provided in a way that allows residents to maintain their independence and dignity. 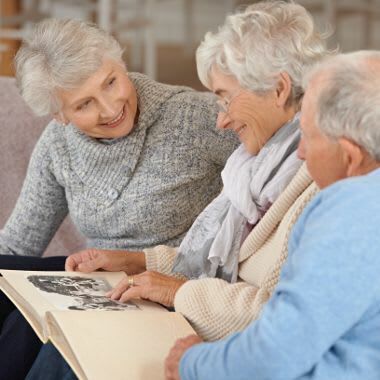 At Rose Lane, we understand the challenges that accompany Alzheimer’s disease, both for residents and their families. Let us be the shoulder you lean on during this difficult time. In keeping with the latest research on environmental design for those with memory loss, Rose Lane neighborhoods promote resident independence, well-being and functioning at their highest level. Unobtrusive security systems, natural sunlight, contrasting color schemes, and smaller scale design are some of the features or our communities. Dining is an essential part of life and health. Food is not only necessary for nutrition but is also an important opportunity for regular and ongoing social engagement. 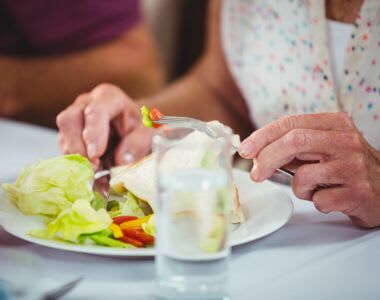 At Rose Lane, mealtimes are more successful and enjoyable in our cozy dining rooms featuring small dining room tables which help to encourage conversation and allow staff to offer help queueing during dining, as needed. Our dining program offers meals that are home-cooked for flavor and served home-style for comfort and convenience. Rose Lane… because your family is like our family.